Now I write this with a shaky hand, now on my tenth cup of espresso in this hour. My blood boils with caffeine, my sanity fading as anxiety grips me to the soul. I was not always in this state. It all began with my recent investigation in Mexico. A man recently interned in a sanitarium there told a bizarre tale from a dark time in the recent history of the continent. He claimed to be a descendent of a conquistador who traveled here in search of gold. His ancestor was among the Spanish invaders who wiped out a cult even feared among the fierce Incas. Hints of blasphemous rituals involving blood sacrifice and non-diary creamer show up in a fragment of a tablet from Machu Pichu. They worshipped Koofiicoatl, a forbidden god of the harvest, whose sacred plant bore fruit stimulating to the native peoples. The eradication of the obscene cult drove some of the conquistadors to madness. Many killed themselves, but one, Pedro Valdez, set forth to collect the accursed fruit. His insane hope to yoke the eldritch power of Koofiicoatl. From generation to generation, this accursed birthright has passed to each following Valdez. Juan was what he claimed his name to be, the last ancestor of Pedro Valdez. Before his internment, he claimed to follow the old ways, complete with an unearthly beast of burden. A researcher from Miskatonic University, I heard of this story and traveled to meet him. I was spurred by a lesser-known reference in the coffee table edition of the Necronomicon, written by the Mad Arab. In it a similar entity, Fol'Juurs, is stated to come from beyond the stars, his foul fruit beguiling to men in a far-off land. It warns that should the seductive seeds spread over the world, so would his influence. However, I arrived too late. Juan was found dead of caffeine overdose, his corpse in a state of hideous rictus. Shattered decanters of ancient-looking pottery littered the room, remains of coffee in them and written in non-diary creamer on the wall was the phrase, "The dark god comes for his servant, and his true name is Fol'Juurs." The sinister plan of the blasphemous fertility god now comes to light. 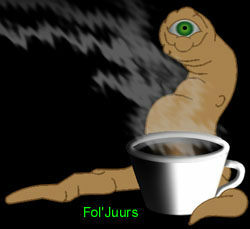 Coffee is now all over the world, Fol'Juurs' subtle control of mankind is complete. Now as the dreaded machine completes its last cup of double espresso, I take a small sense of relief in my hollow victory. That I will expire at my own hand before the dark god comes to claim me as well.